Embroidery Design: Easter Eggs/words = 2.5" X 5.18 "
Get your Easter Baskets ready, this is a great Easter gift! This is a white hand towel that has Happy Easter written in lime green and a colorful set of Easter Eggs. The eggs are lime green, pink, orange, blue and gold colors. This design is about 14,000 stitches which makes this really stand out on the towel. 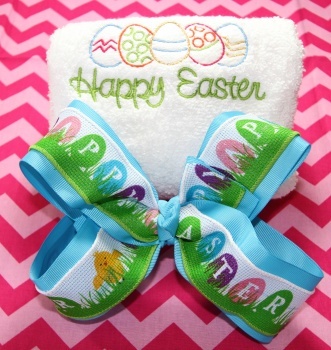 The Easter bow is a double lined grosgrain ribbon. The bottom is a 2.25" Turquoise layered with a 1.5" mesh with wire ribbon on top that says "Happy Easter". The eggs are multi colors of pink, lime green, turquoise and purple that repeat down the bow in a bed of grass. The little yellow baby chick peeps out too. The center is a french knot with the turquoise grosgrain ribbon and it is attached to a French clip. What a lovely set this towel and bow will make for her Easter basket on Sunday morning.